The steel drum is a tuned idiophone traditionally made from an oil drum, but today is made of high-quality steel. To make a steel drum, or a pan, the bottom of an oil drum is first pounded into a bowl, then shaped and tuned with hammers to form distinct resonating surfaces. Steel bands are stylistically versatile, but the most common steel band conventions of melodic phrasing and rhythmic structure are related to Calypso music. While the first steel bands included instruments such as soap boxes, biscuit tins, and dustbins, modern steel bands include vibraphones, cow bells, congas, bongos, triangles and other percussion instruments. Drums are made in families: bass pans, rhythm pans, and tenor pans. 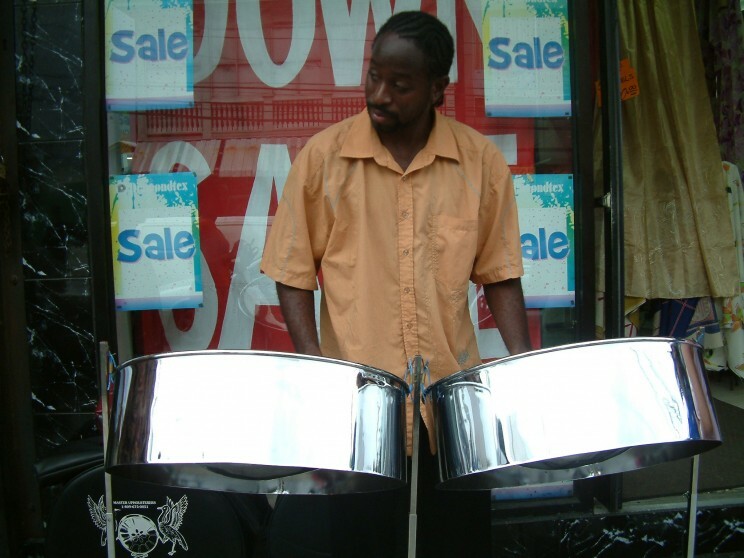 A steelpan player on High Street in Trinidad and Tobago. Photo by Shanel. CC by-SA 3.0 via Wikimedia Commons. The steel band developed directly out of bamboo stamping tube ensembles, which provided carnival music for the lower-class in Port of Spain after a British colonial law restricted the use of drums with skin heads. “Band wars” between rival steel bands emerged in Trinidad, complete with street fighting. Membership in a band soon became interpreted as hooliganism signaling creole disdain for European norms. Manufacturing steel drums is a highly specialized skill. Pans are not standardized, as competition between rival bands fostered innovation in tuning and design. Winston ‘Spree’ Simon of the John John steel band is credited with making the first pan. In 1946, his band performed Ave Maria and God Save the King for an audience that included the British Governor. As of 1992, the steelpan is Trinidad and Tobago’s national instrument. However, the notion dates from the 1940s when the steel band’s musical transformation was driven by competition between bands as well as by the efforts of progressive middle-class individuals to promote what they viewed as an indigenous art form unjustly maligned by colonial cultural standards. Popularity of the steel band has grown. They are now plentiful in Caribbean diaspora communities as well as non-Caribbean communities all over the world. While Trinidad and Tobago continues to be the center, countries like Sweden, Switzerland, and Japan are now hubs of steel band activity. Do you have any other fun facts about the steel drum to add to our list? Featured image: oberlin steel drum 1. Photo by istolethetv. CC BY 2.0 via Flickr. 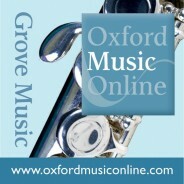 Victoria Davis is an Assistant Marketing Manager in the Online Product department at Oxford. My information is that the steel pan originated in Antigua and became popular in Trinidad. Your information is incorrect. History shows the steelpan was originated in trinidad and became popular in antigua. Trinidad’s only fault is not getting it patented so that people can’t claim the instrument. Wrong point about the steelpaa. Winston Spree was born in 1933, Delabastide sold Spree that ping pong for a shilling. sonny Goddard wrote this history. The Steel pan instrument is the only musical instrument created in the cycle of fifth intervals in te history of music. Anthony Williams is the designer. does a calypso steel drum, like the one a consumer can purchase on ebay, share the same note interface of a steel drum that one would play at say a resort in jamaica? Or, do they contain different interfaces with different notes listed? While Winston Spree Simon has discovered how to get different pitches by denting different sized bubbles, it was Ellie Monnette that made a first steel drum with 14 notes out of a 55-gallon oil barrel.